This PDF 1.7 document has been generated by PScript5.dll Version 5.2.2 / Acrobat Distiller 10.1.8 (Windows), and has been sent on pdf-archive.com on 09/01/2014 at 12:21, from IP address 194.175.x.x. The current document download page has been viewed 549 times. File size: 97 KB (6 pages). collaboration with the corporate strategy department. important is sustainability in terms of a company’s reputation? and the achievement of targets. KM: How is sustainability anchored in an international operating network? be seen in the context of all a company’s responsibilities – economic, social, and environmental. strong correlation between conviction and effectiveness. KM: How big is your communications unit, and how is it structured? unit we’re looking into this question as part of our internal strategy process. KM: How do you work together in the Bosch Group’s global communications? growing in strength. Interaction is increasingly virtual and intensive, also across national borders. new media. There’s enormous economic pressure, which leaves little time for intensive research. journalists also have to take into account completely new habits of of media use. 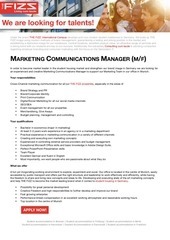 KM: What does this mean for corporate communications? who employ radically different marketing techniques. KM: How would you define the mission of a modern communications department? 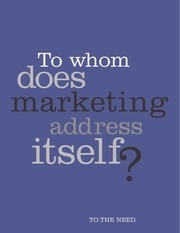 KM: What does this mean in terms of brand management? abandon what made them strong in the past. KM: From your point of view, what is the decisive success factor in change projects? KM: What skills are required of today’s and tomorrow’s communicators? 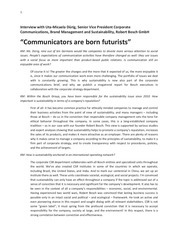 KM: So communicators are visionaries? their antennae tuned to all our relevant stakeholders. much weaker public profile. How did you succeed in making Bosch more present, open, and transparent? How did you manage to give people a better insight into how the company ticks? enjoyed by our communications experts. words, solutions that improve quality of life. overlap in their priorities, such as their focus on the high rate of youth unemployment in Europe. bustle of communications work, and that’s the in-depth exploration of issues such as sustainability. Which is why I’ve undertaken to expand our work on this kind of content over the next few years. KM: Would you also be tempted by a challenge outside communications? business, media, politics, and social engagement, and thus people with many ideas for the future. 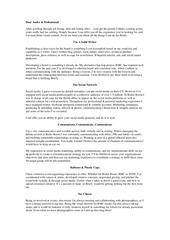 corporate communications and public relations at various universities and journalism schools since 1996. This file has been shared by a user of PDF Archive. Document ID: 00141393.